culture and the practices sustaining migrant social movements. Combining sustained historical engagement with theoretical inquiries, she addresses how struggles for racial and gender equity, cross-border unity, and economic justice have defined the Mexican presence in the United States since 1910. Schmidt Camacho covers a range of archives and sources, including migrant testimonials and songs, Amrico Paredes last published novel, The Shadow, the film Salt of the Earth, the foundational manifestos of El Movimiento, Richard Rodriguez memoirs, narratives by Marisela Norte and Rosario Sanmiguel, and testimonios of Mexican women workers and human rights activists, as well as significant ethnographic research. 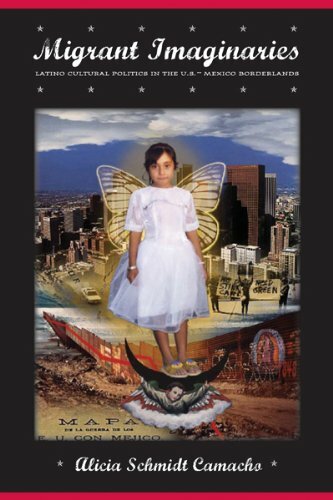 Throughout, she demonstrates how Mexicans and Mexican Americans imagined their communal ties across the border, and used those bonds to contest their noncitizen status. Migrant Imaginaries places migrants at the center of the hemispheres most pressing concerns, contending that border crossers have long been vital to social change.